The European Commission (EC) has finally confirmed what we've all known for years: if you shut down one online piracy site, another will simply take its place. 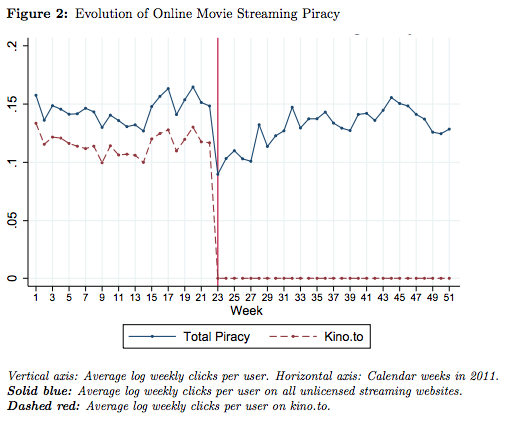 A report published by the EC's Joint Research Center found that the closure of Kino.to, a popular unlicensed streaming site in Germany, had little impact on national online piracy. The team analysed the web activity of 5,000 German citizens, and found that while there was a sharp decline in June 2011, when the site was pulled offline by officials, average piracy levels quickly returned to normal. In addition, researchers concluded that Kino.to's demise did little to encourage licensed alternatives. Instead, a group of new illegal streaming sites rose to prominence -- kinox.to, mega-stream.to, video2k.tv and streams.to, among others. None of these findings should come as a surprise. Still, hopefully the EC report can serve as a point of reference for lawmakers and the entertainment industry fighting to shut down similar sites. Ultimately, regardless of how many resources are thrown at the problem, people will always find a way to upload, share and watch content illegally.